and strain into a chilled cocktail glass. Ted Haigh recommends putting a swatch of orange peel in it, but I don't have any oranges, so I skipped that part. Yes, I know the garnish makes a difference, but I don't keep oranges in the house, so I can't do that. And the drink is still good, and I am still happy with it, so I only feel a little bad about not putting the orange. Yes, this drink is good. 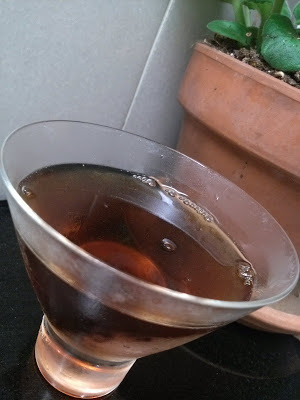 The combination of sweet vermouth and Fernet Branca are perfect. They are medicinal and sweet with aspects of mouthwash and chewing gum and chocolate candy. It is a perfect cool evening drink. So if you're in Houston with one of our cold fronts (winter is merely a series of cold fronts here, after all), make yourself a Hanky Panky. Or if you're in the northeast wishing you were here in Houston, then you should make yourself one, too. By the way, we're all thinking about you, northeast. We hope you pull through. After all, there are a lot of good cocktail bars up there, and we all need you. Just kidding. We love the rest of you, too.